Four distinct Palaeozoic episodes of marine carbonate sedimentation are reported in the Ossa-Morena Zone (SW Iberian Variscides). Among them, the Cambrian and the Devonian episodes are those that are well represented in the Portuguese domains of the Ossa-Morena zone. In this zone, the strong Variscan deformation and metamorphic recrystallization obliterate the biostratigraphic contents of some carbonate local successions and their ages have been based on lithostratigraphic correlations. The 87Sr/86Sr values for the Ossa-Morena zone carbonate rocks allow to make an isotopic–lithostratigraphic correlation, based on the comparison between strontium ratios of marine carbonate rocks without chronological data and carbonate rocks with a good age control. Moreover, the established 87Sr/86Sr fingerprints of the marine carbonate episodes from Ossa-Morena zone should be simultaneously correlated with the worldwide seawater 87Sr/86Sr curve. Despite the interaction of the marine carbonate sedimentation with late secondary dolomitization processes or with high-temperature metamorphic/metasomatic fluids, which increases the primary 87Sr/86Sr ratios, this methodology allows to define two main distinct clusters of 87Sr/86Sr for the Ossa-Morena zone marine carbonates: a Devonian cluster with strontium ratios lower than 0,708000; and a Cambrian cluster ranging from 0.708777 to 0.708299 (0.708575 ± 0,000161), that can reach 0.709227–0.708866 (0.709087 ± 0,000118) if incipient late secondary dolomitization or high-temperature metamorphism/metasomatism operated. 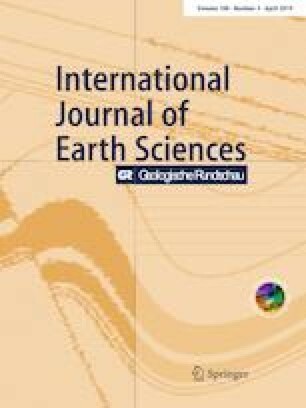 The obtained 87Sr/86Sr isotopic ratios corroborate the lithostratigraphic correlations between the carbonate rocks of Abrantes, Assumar, Estremoz, Viana-Alvito, Ficalho and Escoural successions with the Ovetian–Marianian limestones of Alter-do-Chão–Elvas Succession. Moreover, this methodology allows to establish the isotopic discrimination between the Upper Silurian–Devonian limestones of Ferrarias, Barrancos and Bencatel successions and the marbles of Estremoz Succession. We are grateful to L. A. Eguíluz and an anonymous referee for their insightful suggestions that contribute to improve the quality of the final manuscript. The editorial work of W.C. Dullo should be also emphasized. N. Moreira acknowledges Gulbenkian Foundation for the financial support through the “Programa de Estímulo à Investigação 2011” and Fundação para a Ciência e a Tecnologia (FCT; Portuguese Science and Technology Foundation), through the PhD grant (SFRH/BD/80580/2011). N. Moreira, R. Dias, J. Pedro and A. Araujo acknowledge the funding provided by the Institute of Earth Sciences (ICT), under contract with FCT (UID/GEO/04683/2013) and to COMPETE POCI-01-0145-FEDER-007690. This work is a contribution to the project ALT20-03-0145-FEDER-000028, funded by Alentejo 2020 through the FEDER / FSE / FEEI. J. F. Santos and S. Ribeiro, received financial support from the GeoBioTec research unit, which is funded, by FCT, through project UID/GEO/04035/2013.